On what will be her first Olympic outing at Beijing in 2008, the American long-distance swimming queen Kate Ziegler may turn out to be one of the stars of the show. From Great Falls in Virginia, she'll have just turned 20 when the Games get underway but this calm athlete who stands at 1.80m is reaching her prime early and four world titles (800m and 1500m - 2005 and 2007) plus a world record at the non-Olympic distance of 1500m are testament to that promise. Over this last distance in June 2007 she took ten seconds off the record set way back from before she was even born. Janet Evans set the previous record March 26, 1988 at 15min 52.10sec but at Mission Viejo in California, Ziegler finally beat that legendary record with a chrono of 15min 42.54sec. This young 2006 Pan Pacific champion over 800 and 1500m in 2006, also has the talent to shine over 400m and 200m. 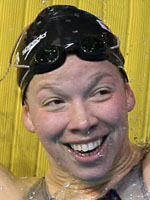 Albeit at a short-course meet in Essen Germany, Ziegler beat world 200m silver medallist Germany's Annika Lurz in 2007. Ziegler will have fond memories of the German town as she also beat short course world records at both 800m (8min 8.0sec) and 1500m (15min 32.90sec) previously held by French star Laure Manaudou. Her relentless progression has come under the guidance of coach Ray Benecki, who feels the 800m title in China is there for her taking, and with her great rival Manaudou thinking of leaving the 800m off her own Olympic roster the American has every chance. At the 2007 world championships, images of the titanic neck-and-neck struggle over the final laps of the 800m between Manaudou and Ziegler was one of the lasting memories of the meet. This balanced young woman is the daughter of a bank president and prior to choosing to concentrate on swimming she was keen on both handball and basketball. She says she would like to work in psychology or design after her swimming days are over, but before that she'll have her own designs and the right psychology to make Beijing a memorable and maybe golden event.